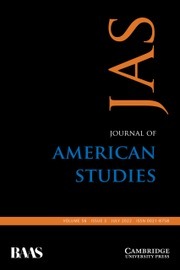 Journal of American Studies seeks to critique and interrogate the notion of "America", pursuing this through international perspectives on the history, literature, politics and culture of the United States. The Journal publishes works by scholars from all over the world on American literature, history, institutions, politics, economics, film, popular culture, geography and related subjects in domestic, continental, hemispheric, and global contexts. Its expanded book review section offers in-depth analysis of recent American Studies scholarship to promote further discussion and debate. The journal is intended not only for students and scholars, but also for general readers with an interest in the United States. Roundtable - Amy Hungerford, Making Literature Now (Stanford, CA: Stanford University Press, 2016, £45.75 hardback, £13.58 paperback). Pp. xiii + 199. isbn978 0 8047 9512 8, 978 0 8047 9940 9.